Forty-two is the number of stops we had during our 40 years in the desert, with some stops lasting a few days, and some for years. It is said that each of us also has many stops in the journey of our lives. After my bat mitzvah and obligatory party, feted by champagne and my family’s business friends, I was released at last from the obligation of having anything more to do with Judaism. And so, my Jewish journey had a stop that lasted for the next 25 years. anticipated that the death of a stranger would be a life-changing event for me. 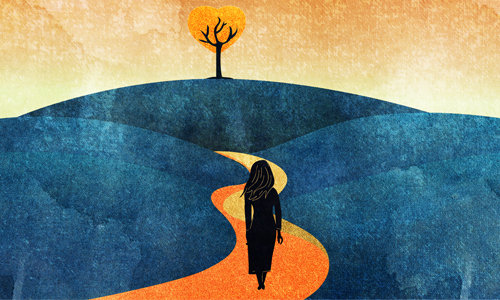 Hearing how active and vital this woman was in the Jewish community and feeling alarmed over the impact and void left by her death, my heart awakened and, much to my surprise, I felt that I wanted to make a difference.But how? Until that moment, I didn’t even identify as Jewish, much less being part of a community. And so I started on my spiritual journey again, making a series of stops here and there, looking for my Jewish identity and yearning for connection. The command to find a perfect and completely red cow, without a single white hair on its body (try to find one), sacrifice it and use its ashes for ritual purification are incomprehensible and irrational. Even more astounding is that the ritual results in opposite effects; it causes both purification and contamination. Upon hearing this, a man stood up and said, angrily: “What is this, Nazi Germany, that we just have to follow blindly orders that make no sense?” I looked around at the heads nodding in agreement. Before I even knew what I was doing, I was on my feet protesting the comparison. The rabbi sincerely thanked me for my “G‑d-oriented comment,” and I sat down, my face flush and tears oddly in my eyes. If one’s agenda is to conclude that Torah is arcane, obsolete and without relevance or purpose, and if you want to view those who live a Torah-observant life as blindly following irrational orders, then this Torah portion, Chukat, fits the bill. People tend to think that Torah laws come in two categories: rational and irrational, laws that make sense and are good to live by . . . and everything else. Once we determine that something is “irrational,” we so-called “rational beings” feel free—obligated, even—to discard it and dismiss anyone who takes it seriously. But the problem with that much “certainty” is that it closes off exploration, and it shuts off possibility. You have come to the end of the line of inquiry, and you are also intellectually dishonest because you are selective with irrationality. Anyone who thinks we don’t live in an irrational world has not had to apply for a driver’s permit in Pennsylvania or had to try a legal case in Rhode Island (where the courts shut down every week because there are insufficient sheriffs to unlock the courtrooms) or deal with divorce clients. And if I were a truly rational person, I would never eat foods that I know are bad for me. I would never use negativity to try to create positive change, and I wouldn’t bother taking off glasses that weigh two ounces before I weighed myself. But I live an irrational life. We all do, and we just accept that quality in ourselves. But the laws of the Red Heifer and many laws for which we see no rational basis are not irrational. They are, rather, “supra-rational”—meaning that they are outside of rationality. It’s just not “figure-out-able,” and your attitude to that gap between you and the unknowable is a good indicator of where you are in your faith and relationship with G‑d. And so, if you want an example of the ability to live with the mystery of the supra-rational, and to find deep meaning and fulfillment in the encounter with another realm, then this Torah portion, Chukat, is also the Torah portion that fits that bill as well. people who may be unfamiliar with the customs of Orthodox weddings, and I read the description of the bedecken, which takes place right before the ceremony when the groom looks at his bride and then covers the bride’s face with a veil. With this simple gesture, the groom is making a profound promise to his bride: I will cherish and respect not only the “you” that is revealed to me, but also that about you, which is “covered” from me. As I bond with you in marriage, I am committed to all of you, all of the time.I joyfully realized that this, at last, was the answer to the man who questioned blindly following G‑d’s decrees. When we, the Jewish people, stood at Mount Sinai and accepted Torah, we became eternally betrothed to G‑d—to the parts of G‑d that are revealed, as well as to the parts of G‑d that are covered—to all of the parts of G‑d, all of the time. That is the basis of true commitment because no relationship, however deep and intimate, can fully uncover or completely unmask another. We contain unmapped territories, hidden even from ourselves. How much more so with G‑d? When we accept that, then the very questions we ask change. We don’t have to be churlish and demand instant answers to everything, especially since answers can trivialize serious issues and are far from soul-satisfying. So when you are challenged, frustrated, afraid or uncertain when aspects of G‑d, your spouse, yourself or your life are covered and unrevealed to you, or seem irrational or supra-rational, do not fall into an easy and false certainty that cuts off possibility, and stops your journey to growth and transformation. Embrace the struggle that is part of a nuanced and complex life. Be humble and stay open to the lesson. We all encounter situations that we can’t understand. Think about something you have been asked to do that doesn’t make any sense to you, then write down what positive lessons you can learn from doing something that you may not understand, but is important to someone or something else. Now think about your own needs. What is something you ask of someone else that may not make rational sense, but makes a difference to you? How does it make you feel when someone complies with this request even though it is not something this person would think to do on his or her own? Everyone in our lives knows us in a different way. Some of our characteristics are more revealed, some very concealed—sometimes, even from ourselves. Write down five things about yourself that few, if any, know. How do you think people would react if they did know these parts of you. Next Post ¿Es verdad que la cabalá está prohibida antes de los 40 años?